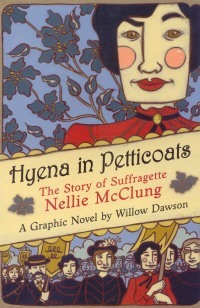 Political Comics Review ~ Willow Dawson’s "Hyena in Petticoats"
I first picked up H.I.P. at the 2011 Toronto Comic Arts Festival, but I didn’t buy it. However wrongful it is to judge a book by its cover, I quickly surmised that “Hyena in Petticoats” was A) a comic for kids and therefore not for adults, and B) an ‘historical’ as opposed to ‘political’ comic, and within that, just another entry in the Canadian corner of the fad that is historical graphic novels… All pop, no substance… ‘meh’ was my initial response…. “It is the writer’s place to bring romance to people, to turn the commonplace into the adventurous and the amusing, to bring out the pathos in a situation … Words are our tools and must be kept bright … I refuse to be carried through the sewers of life just for the ride … I write if I have something to say that will amuse, entertain, instruct, inform, comfort, or guide the reader”. Nellie McClung was one of Canada’s foremost women’s rights suffragettes in the 1910’s and 20’s. As a Christian woman who witnessed how naughty Christian men became after getting tanked on whiskey, she first felt mobilized by the campaign for prohibition–which, across the English-speaking world, was the issue that really begat the 20th Century women’s suffrage movement. She doesn’t have the iconography dedicated to her like some other women of the time—Emma Goldman comes to mind—but Nellie McClung was a pretty profound woman. She led marches, organized political campaigns in several provinces, and fought with former Manitoba Premier Rodmond Roblin on a few occasions. She also helped to write, produce, and act in a play called “Women’s Parliament”, which not only showed what women could bring to the table in politics, but took the behavior of male politicians at the time and turned it on its head. According to the comic, it looked like offensive satire at its finest. I would LOVE to see someone re-create this play. The simple, smooth paint-brush strokes of the pages were what initially gave me the impression that H.I.P. 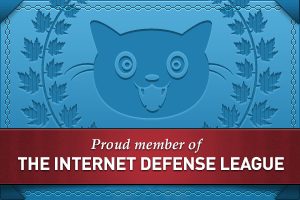 was just for a younger audience. In the past I’ve found comic books with this kind of art to be difficult to dive into, feel submerged by (Chester Brown’s Louis Riel is another [sad] example for me, despite its incredible narrative). I guess I just have an aversion to minimalism. Comics, to me, is all about conjuring—reaching into the very essence of the creator’s idea, and trying to mimic that headspace on the page. But I was pleasantly surprised at how easily I slipped into the world of Nell. There is a charm in the day-to-day interactions that Dawson chose to include in the storytelling, and the little drawings that decorate the page numbers, that puts one at ease—the same charm that draws us to, say, entries in a young artists’ journal. It was enough to help me reassess my bias… minimalism is, after all, a style that superficially implies effortlessness, and yet there is a perfectionism that is needed for that to be realized. I also appreciate the political context that Willow Dawson adds to this inherently historical comic. This is, again, where I thought I would have beef with H.I.P.—mainstream histories that are simplified (as a kids’ book, a comic book, an article in a high school history book) generally neglect a movement or individual’s shortcomings, for the betterment of an ‘idealistic’ story. Dawson doesn’t do that. In fact, she goes out of her way to point out a few truths that, to some, may seem like unnecessary details, but to someone like me, give me a better-rounded picture of Nellie McClung: her fight was that of a white, middle-class Christian women’s movement. The gains of this movement did not extend to Asian-Canadians or Native women, who would not get the vote for another staggering four decades. I am grateful for Willow Dawson including this information, which is provided in a way that is informative and intriguing to me, but would also be totally up the alley of my 8-year-old niece (who will surely inherit this copy, come Winter Solstice.) In fact, I feel more comfortable giving her a book that points out a prejudice that was/is more deeply-seeded in the Canadian power structure than sexism: the question of Indigenous rights. This obviously isn’t a review that everyone would write about Hyena in Petticoats. But coming from the perspective of a political comic book collector, these are the points that matter to me. And maybe this is a kid’s comic…but not only a kid’s comic, and it is secondary to the fact that it is a great little book.